How many of you have a scrap space? Raise your hand. Ooh ooh!! Pick me! Pick me! Pick me!!! I am actually really lucky and have a whole room devoted to my craft. I know, I know, I am spoiled. Well sadly this said space is in severe need of organization. Let me tell you this issue is the answer!! There are so many amazing space in this issue. No matter your space they cover it. From small to big! What's even more fun is seeing people we "know". Our very own Liz Hicks and Wendy Sue Anderson are featured, as well as former reporter Aly Dosdall. So with all the inspiration in this magazine, I am going to go and revamp my room. I hope to get to it this weekend and have it finished by next week. I will take pictures of it when it is finished and report back. Sound fun!!? Want one?? Leave a comment by midnight EST on Saturday to be entered to win! Can't wait for the winner to be announced, get one at the online store and get free shipping with this code: SPACESBB Here is a sneak peak of it. CLICK HERE. Love! Love the colors, love the patterns. And love the simplicity of it, sometimes all you need is great patterned paper to get inspired! I would love to win this fabulous special issue! i'm really in need of some inspiration to jazz up my space. I hope I win! Thanks for tha chance! Can't wait to get my hands on this magazine!!!! I'd love to win this issue! Thanks for the chance! I in fact am currently in the middle of remodeling my den. I don't have an overall design theme or anything. So this would be really helpful!!! I have my paint picked and up, and some cabinets installed, I just need to finish the cabinets and figure out the rest. Thanks Ashley, for the chance to win! Totally need to organize my scraproom. Thanks for a chance to win! I definitely need this magazine. I have a whole scrap room that I hardly get to see because I work full time and go to school full time. IN my 'free' time I play with my baby and watch movies with my husband; that's when I'm not studying or making dinner or doing 'mommy/wifey' things!! After we sell our house, we will be downsizing so I may lose my scrap room and instead occupy an awesome hutch, so I want to get some scrappy ideas of how I can pair down and really utilize a small space :) (like a hutch or closet for storage)! 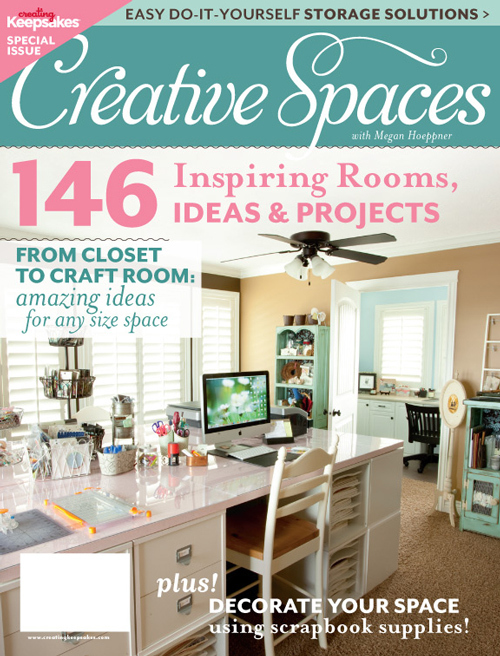 I love, love, love drooling over beautiful creative spaces, so I would love, love, love to win this publication! Oooh, I love this special issue. I hope I win so I can see the fabulous Liz Hick's room! Love her! I don't have a scrap room, but would love to win this soI can organize my small space better! Oh wow, I would love to win it! I'm planning my studio and this issue would be awesome, especially as it's not available here! I have a space but am always thinking how uninspiring it is and how much better it could be (yes, I'm spoilt!). Would love to win to give me the chance to turn this room in something gorgeous! I really want to pour over this issue!! Creative spaces inspire me! I love good organization tips too!! Looks like a great special issue!! Oh I'm so glad you reviewed this issue! I was looking at it online the other day trying to decide if I wanted to get it. I just moved into a new home and my scraproom is a big mess. I need some ideas! I love looking at other people's craft spaces and can't wait to see this issue. Thanks for the chance to win one. I converted a spare bedroom into my very own craft room but I could use some advise on how to finish it for my card making hobby. I'd love to win this magazine. I have a pretty great space already but am always looking for ways to change it up and make improvements! Would love to see what's inside this special issue!